When I was young Sir Walter Scott’s Ivanhoe was required reading, something which didn’t appeal to most of us. Of course, I survived that tale and Scott’s other romantic efforts. As an adult, I was ready to visit Scott’s home, Abbotsford. What I didn’t expect was to feel a sense of identity with Scott. The grounds are lovely. 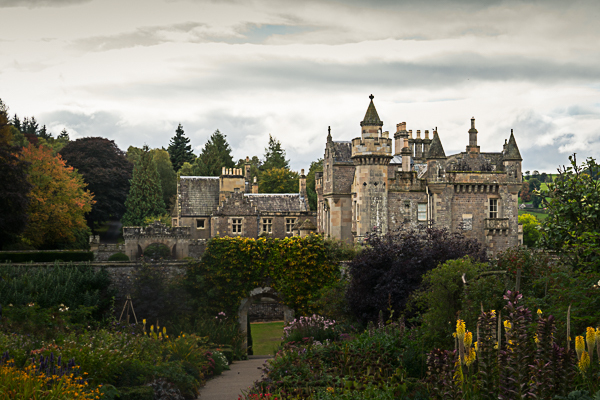 I think the image above is the south garden; there are three distinct gardens, all designed by Scott. It’s known as the Morris Garden. The kneeling figure is a statue of Morris, the exciseman from Rob Roy. He’s pleading for mercy from Helen MacGregor. Does this sound right to those of you who have read Rob Roy? The true clincher for me was the house. Step inside and be transported. Scott was an avid collector. He collected everything! All periods, willy-nilly. That’s my kind of fella! He didn’t always know what it was but he knew if he liked it. How wonderful to live life with such enthusiasm! The miscellaneous things displayed in the photo above give one an idea of his eclectic tastes. He also collected books. 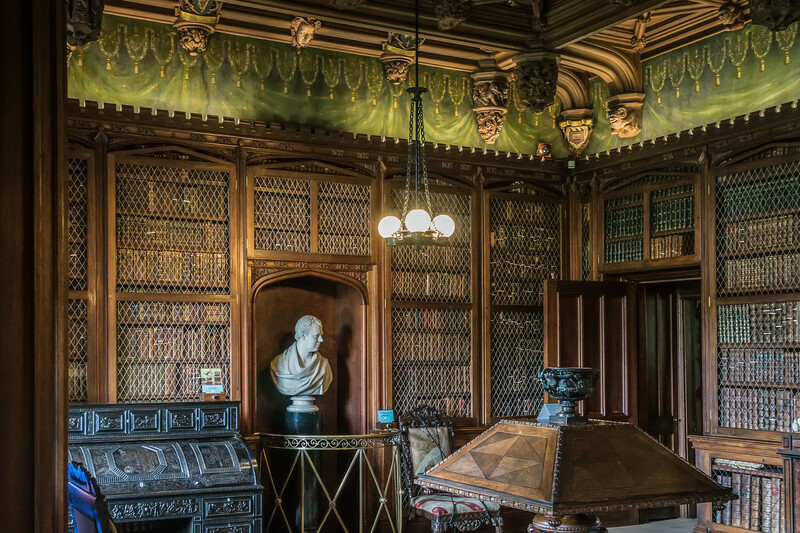 His library is a wonderful room with books floor to ceiling. The books here cover all sorts of things, not just the writings of Scott. There are reference guides and manuals. These are probably books about the local area flora and fauna. Scott seemed to have an interest in all manner of things. Other authors also sent him books. The Brothers Grimm sent him one of their first books of fairy tales. 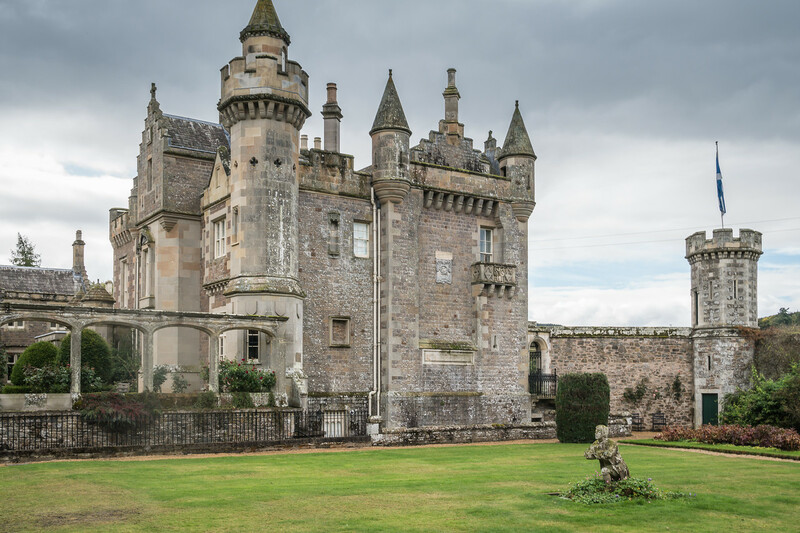 No grand estate in Scotland is without a display of weapons and Abbotsford was not to be lacking. 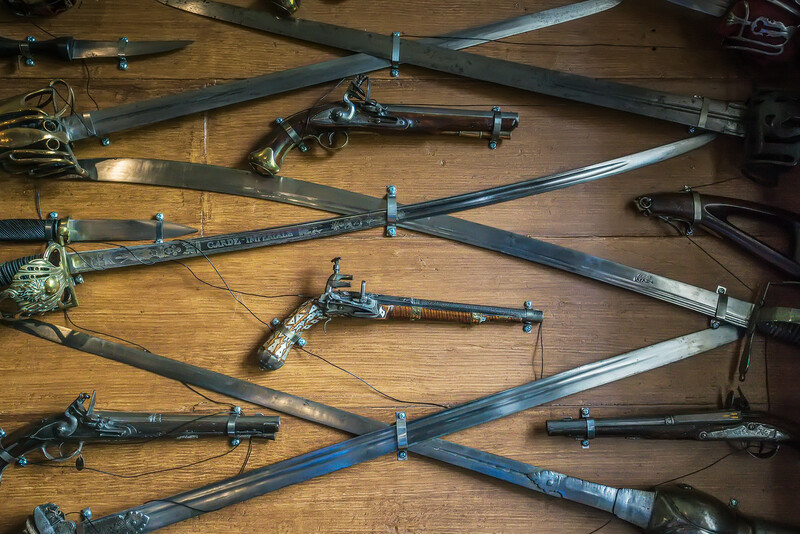 A small section of the weapons on display at Abbotsford. Whether the object dated to the time of the Romans or belonged to current 19th century, Scott was interested. 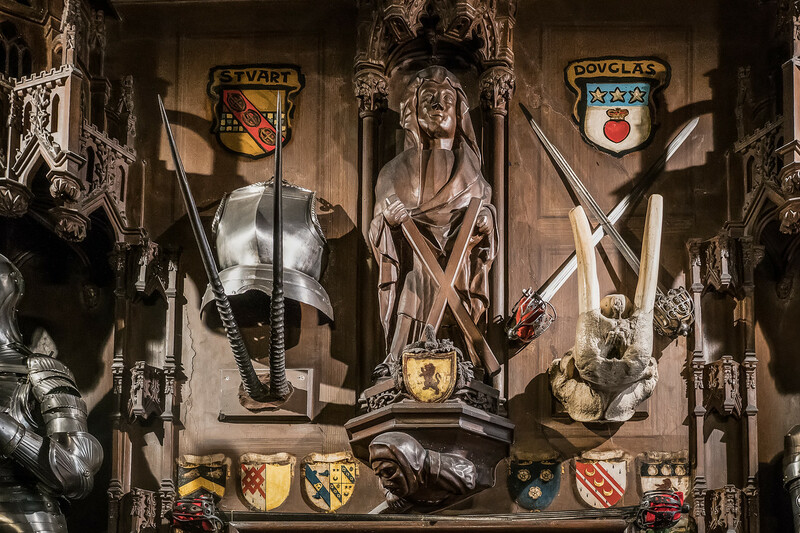 Weapons, stories, armor, it all found a way into his life at Abbotsford. Somehow, I like him for this minor obsession. Abbotsford made him happy. In his later years, he fell on hard times. Investments didn’t turn out as planned and he went badly into debt. I’m sure Abbotsford didn’t do anything to help his financial position. But he wrote constantly in an effort to pay off his debt. He probably died of overwork. At least he died at the place he loved, his home at Abbotsford. While this isn’t an old castle, Abbotsford is still a great place to visit. There is a visitor center at the entrance with information and nice gifts. There is also a restaurant upstairs. The service was good, the setting attractive, and the food excellent. To see more of my images from Abbotsford, please click here. Copyright © 2013 Little NEKO / All rights reserved.